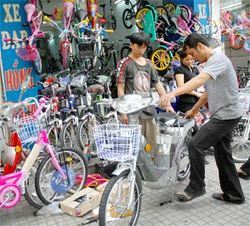 In China, electronic bicycles are all the rage. Recent studies have shown that in China there are now four times as many electric bicycles as cars. There’s no doubt about it: e-bikes are cool. The tally is currently over 100 million in the nation, with some estimates topping 120 million. Despite friction due to concerns over the bike’s safety and an uproar from both sides over a possible mandate of licenses for riders, that number continues to grow – and may hit the 200 million mark by the end of the year. The bikes are sleek, speedy, and maneuverable – easily darting through sluggish traffic or down cluttered alleyways. It’s no surprise that they’ve caught on with the youth. On an e-bike, one can silently glide up behind a pedestrian without them even knowing. Or, as has sometimes been the case, speed towards unsuspecting victims and clip them unawares. But it’s not just young people that have taken a liking to e-bikes. The electric speedsters are becoming a choice way to get people where they need to go. Another advantage of e-bikes and contributing to the recent surge is that they are a way around bans on internal combustion engines (traditional gasoline). In China, electric has been the way to go. While e-bikes have zero emissions, that does not mean they are zero waste. Energy has to come from somewhere, and in the case of e-bikes it is an electrical socket. This effectively means that an e-bike is only as clean as the grid used to power it. In addition, the Wall Street Journal reports that about 95% of the bikes sold in China are outfitted with lead batteries. Though nearly completely recyclable, these lead batteries have proven to be far from clean. Some studies have shown, if you (consider) the lifecycle of the bicycle – that means the production, the smelting, to the recycling of this lead, these little e-bikes produce [much worse] lead emissions than the typical motorcycle. Despite this, the bikes are largely considered more energy efficient and less polluting than cars, motorcycles, and even forms of public transit such as buses. This is good news coming from a country that hasn’t always been known for environmental practices. A solution to lead batteries may come in the form of LiFePO4 (Lithium Iron Phosphate) batteries, which have shown to be an improvement over the lithium cobalt dioxide (LiCoO2) batteries that can be found in most laptops and cell phones. As the materials for producing lithium batteries become more readily available and the manufacturing costs drop, this will present an increasingly feasible green alternative to lead batteries in e-bikes. Cleanliness isn’t the only advantage of LiFePO4 batteries- they are also over four times more efficient at storing and releasing energy than their lead counterparts. E-bikes have proven to be a hit in China, but markets are also steadily improving in Europe and the U.S.
With many different models and designs available, expect this trend to continue. E-bikes will likely begin popping up in urban sprawls, college towns, and places with either a tolerable climate or abundant bike paths and bike lanes. Things shouldn’t stop there. If China is any indicator, e-bikes should be a hit throughout southeast Asia in coming years, and could be primed to make a move worldwide. One question that remains is how growing number of e-bikes will be received in places such as the United States, where often crowded roads predominately feature cars and buses. It is possible that relations between e-bike riders and drivers and/or pedestrians could be strained, as can be the case with conventional bikes. So, what do you think – will e-bikes catch on outside of China? Would you buy one? Electric bikes are great,I had one for years. I would like an other one but unfortunately to by one in the UK is a rip off(as per normal) as they are about Â£550 or about $900. How come the same bike in Malta(EU country) is about Â£200. One thing that always interferes with people saving gas is that the gasoline/oil companies don’t own the electric power plants — Yet! I will absolutely buy one or more. The plus side is that as more bikes are purchased, the designs and efficiencies will improve. Right now, they’re in the stone age and can only evolve as more people purchase and customize/experiment making them better. This whole idea will become a life style, like the old VW Beetles. Let’s not over capitalize and prostitute it to death.